Could Trey Lyles really play small forward? It was Monday morning and Denver Nuggets media day had kicked off. 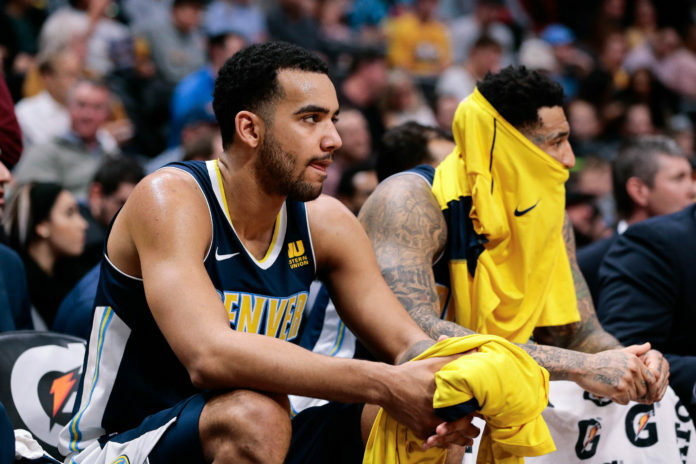 Unexpectedly, Nuggets’ head coach Michael Malone and president of basketball operations Tim Connelly unearthed an interesting topic about backup power forward Trey Lyles. After a question regarding different type of lineups that the team could possibly use, Malone eluded to the fact that the Nuggets could field a big unit that has Trey Lyles at the small forward position. After Lyles’ up-and-down season last year, he appears ready to break out in his second season with the Nuggets. If you ask him, he will tell you the same thing. Lyles is coming off his best year as a professional. In 2017-18, he averaged 9.9 points, 4.8 rebounds, and 1.2 assists in 19.1 minutes per game while shooting 49.1 percent from the field and 38.1 percent from beyond the arc. Former All-Star Paul Millsap missed 44 games last year with a wrist injury and that catapulted Lyles into a more prominent role with the Nuggets. When given more consistent minutes, Lyles exceeded expectations; however, when Millsap soon returned, it forced Lyles into a smaller role. Lyles’ offensive game is expansive. He excels at spreading the floor with his shooting acumen, but he also has the ability to go inside and score. He is best attacking closeouts and using his athleticism to score at the rim, but he can also make quick decisions on the move as a secondary or tertiary playmaker. Right now, his downfall is his defense. Malone was transparent that there was a need for Lyles to get better on the defensive end of the floor in multiple capacities because Lyles has the physical gifts to be able to guard four positions depending on matchup. Lyles is long for being six-foot-ten and will have the opportunity to show off his length and lateral quickness when playing on the perimeter as a small forward. He will have a size advantage over most players, but speed and quickness is where he will have to make improvements if he is to play some small forward during the 2018-19 season. Connelly understand the pros and cons of Lyles operating in a perimeter role. “Offensively, I feel as if (Lyles) has no issue,” Connelly said. “But when you’re playing down a position, it’s a challenge on the defensive end. When you’re looking at elite small forwards, let’s be honest, they are a tough out for anybody. 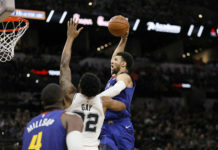 Lyles said that he is more comfortable as a power forward, but he has been working at embracing his role as a small forward if it means that he will be able to play more. Getting a more solidified role in Malone’s rotation has consistently been at the top of Lyles’ offseason to-do list. Added improvement on defense will only help Lyles’ position within the deep Denver rotation and allow the Nuggets more flexibility on the offensive end. He is an extremely-versatile player that has proved he can be relied on and can fit alongside nearly any combination of players. That is important because, as Malone stated, that there would be plenty of tinkering of lineups. Lyles does not need the ball in his hands, he is a hustle player that is always moving and trying to make the right play, and he thrives operating without the ball in his hands thanks to his lethal ability in catch and shoot situations. To say things plainly, defense will be the deciding factoring in how many minutes he will play. Improvement on defense will be key for Lyles. 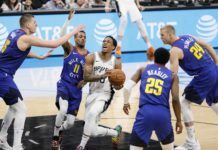 If he shows that he can consistently switch on to smaller guards and still get down into the trenches with more paint-bound bigs, he will be in line to be the player who takes the biggest leap on the Nuggets as far as playing time goes. 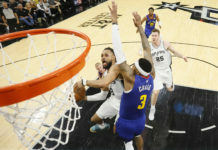 There is no question that he fits offensively, but consistency on defense will unlock other areas of his game and allow him to become a trusted rotational player in Denver.